Congratulations to the 7th-grade girls - CGBL White Division Champions! In the CGBL 7th Grade White Division finals, it was a back and forth game from beginning to end between our very own Simsbury and Wethersfield. It was tied at the at the half and with 90 seconds to go. Everyone in the gym knew that this game was going to come down to the wire. It was one of those games where whoever had the ball last was probably going to win. And true to the script, a Simsbury player rebounded a missed free throw with 8 seconds to go in the game, dribbled down the length of the court, passed to an open player beneath the basket, and that player made a shot at the buzzer to secure the win 41-39! Both teams played great! Congratulations to Simsbury on winning the CBTL 7th Grade White Division Championship!!! Prepare players for a higher level of competition and commitment to continue to play the sport at the next level. Check the Weekly Schedule menu item on the left for weekly games and practice times. During the season, teams typically practice twice a week on weeknights for 90 minutes. Games are usually on weekends. Our teams play in the CBTBL, CGBL and NCC leagues. Click the LEAGUES tab on the left column for league websites. 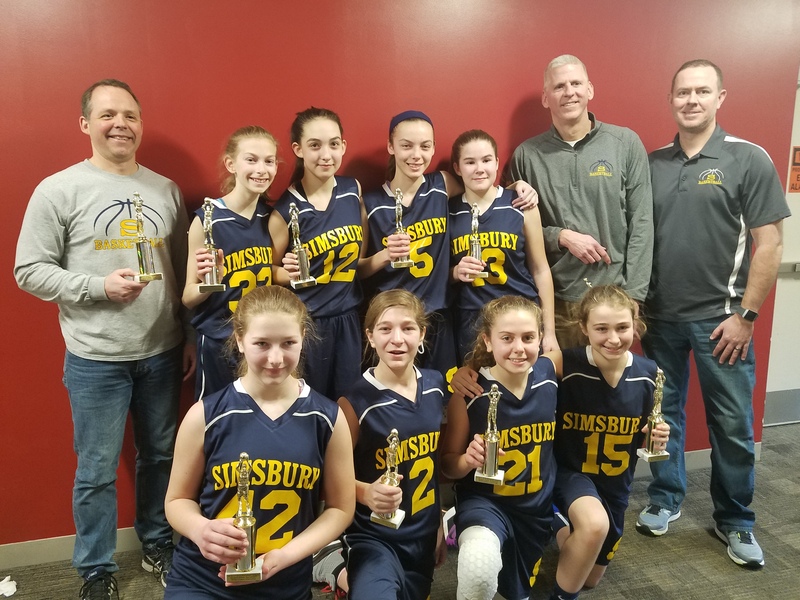 More information about Simsbury Travel Basketball Expectations and Tryouts can be found in the Parents tab. Online Registration for tryouts opens up in August, tryouts take place in October. There is no fee to try out. All STBC Coaches must pass a background check, take the CDC Concussion training course and review the CDC information on staph infections for athletes. The cost to participate on a team for the upcoming season has not been determined yet. Last year it was $325 per player, we expect the cost will be similar this season. Costs include gym rental & custodial fees, game officials, league fees, website fees and team equipment. The fee does not include the cost of a uniform - approximately $75. Individual teams may choose to participate in activities that could require additional costs.